After a purifying yourself in a bath or shower sit before your altar. Purify the space and yourself with a sage smudge (or you can use incense). Cast your Circle in the usual manner. Call the Watchtowers and ask for their aid. Anoint yourself, your candle and the parchment paper with the anointing oil. Begin to meditate on your problem, and ask Isis to give you assistance. Visualize your problem as a dried walnut, hard, bitter and brown. Visualize the walnut beginning to change, turning green and soft, then opening up to expose a beautiful pink flower inside. The healing magick now begins. and whatever is broken can be made whole again. 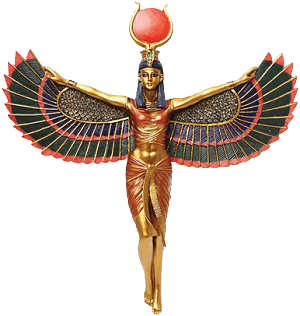 Thank the Goddess Isis for her aid and burn a stick of incense as an offering of thanks.